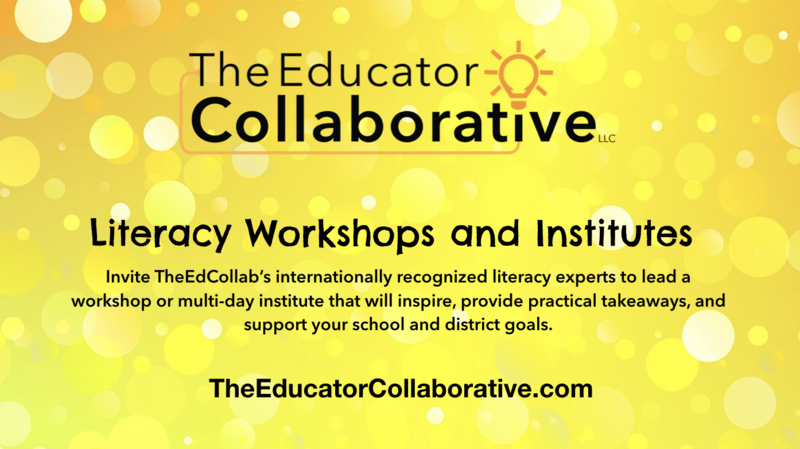 Bring The Educator Collaborative to your school or organization for a full day of literacy learning. Perfect for district in-service days, cooperative educational services workshops (BOCES, CESAs, etc. ), summer professional learning, or any other time you would like high quality, practical, and research-based literacy practices shared with your team. When you host a full-day workshop, we are open to any size group of attendees. Districts are welcome to combine multiple schools or partner with other districts to host. Looking for ongoing consulting support during the school year? Visit our K-12 Literacy Consulting page for more info and to start your request. While many topics can become (or be combined) into multi-day institutes, we note below those that are particularly impactful when taught across consecutive days. The extended time provides more hands-on practice, feedback, planning, and greater depth. Speakers are to be scheduled from 8:30-2:30 or 9:00-3:00 including a lunch break. Days start at $3,500, inclusive. Fees may vary based on location and staffing. Request a workshop using the form at the bottom of this page or make a custom request (here). Here are a sample of some of our Workshop and Institute topics. We are also happy to work with you design a topic and day to fit your needs. (Available K-12) Spend a jam-packed day learning the why, what, and how of reading workshop instruction. This interactive day helps schools, or grade levels, moving to balanced literacy instruction see how the components of reading workshop work together to raise student achievement. Built around theory and practice, your team will learn why independent reading is critical for developing readers and how various methods and structures can support powerful differentiation. Lessons, Read Aloud, Conferring, and Unit Planning will be discussed. Elementary educators learn how to support the developing stages of early to experienced readers. Secondary educators learn how to bring knowledge of literature over to methods that engage readers in real reading. This topic is also available as a multi-day institute, providing more hands-on practice, feedback, planning, and greater depth in multiple text types and genres. (Available K-12) Often times the development of truly student-centered instruction begins in writing workshop. It is the place students’ voices, experiences, strengths, and needs are most visible. Spend this inspiring day learning the why, what, and how of writing workshop instruction. The interactive day will help educators see themselves as writers and then bring that knowledge and experience to their teaching of writing. Built around theory and practice, methods for teaching, conferring with, and ultimately assessing writers will be shared. Lessons, Read Aloud, Conferring, and Unit Planning will be discussed. This topic is also available as a multi-day institute, providing more hands-on practice, feedback, planning, and greater depth in multiple writing types. (Available K-12) The cornerstone of student-centered instruction is the conference. To get the most out of this critical exchange between teachers and learners takes methods and planning. This day will share some of the key behaviors to make the most out of this important time with students. From how to manage a class to allow conferring to take place, to ways of making conferences focus closely on student growth, to tips and strategies for keeping yourself organized. The day is a deep dive into research-based and practical strategies for growing the readers and writers in your school, one conference at a time. (Available K-12) Powerful small group instruction can move readers and writers forward. Small group conferring allows educators to see more students, more often. It also focuses everyone on skill development, when small groups meet repeatedly, over time. Learn how to make data-based decisions in forming, leading, and assessing students in small group conferring formats. See how small group conferring does not need to be time consuming, but, when well planned, can be a powerful asset to your practice. Early childhood educators will also learn about Guided Reading instruction and how to vary small group conferring formats to meet the needs of students. (Available K-12) Come together as a staff to reflect upon your current literacy work and study ways to make your practices more responsive, supportive, and celebratory of the identities, cultures, and goals of your learners. You will learn ways to assess the power and privilege embedded within instructional decision making and see how to open up your teaching to allow more student-driven teaching. From text selection, to teaching methods, to unit planning, join a day that will inspire, challenge, and support your staff in supporting every student in their developing literacy skills. We encourage this topic as a multi-day institute, providing greater depth, exploration, and hands-on planning. (Available K-12) As schools offer more and more ways for students to engage with technology, educators have an opportunity to not just replicate paper literacy on a screen, but to truly add to students’ skill sets and opportunities. This workshop builds on best practices in reading and writing, to help you and your colleagues get more out of your technology investment. Sure, students can type essays or work collaboratively on documents, but with some critical lenses and purposeful planning, students can learn to be content creators, maximize opportunities for debate and feedback, and see their role in the world as critical, active, and empowered. This session will provide practical demonstrations, discussion of key literacy and digital literacy skills, as well as a whole lot of inspiration. This topic is also available as a multi-day institute, providing more hands-on practice, feedback, planning, and greater depth in using digital tools across reading and writing units. (Available K-12) Social Studies standards and practices are in an exciting time right now. The C3 (College, Career, and Civic Life) Frameworks have supported many states in re-imagining Social Studies Instruction. At the heart of this movement is deeper engagement with inquiry as a key set of skills and a foundational instructional model. During this day, learn about the C3 Framework (and your State’s related Social Studies standards, if applicable). Go through a process of designing a compelling inquiry study within Social Studies and engage in content area literacy practices that support students in note-taking, nonfiction reading, creating claims, and engaging in civic action. (Available K-12) Methods for analyzing texts that are rigorous, meaningful, but also joyful, are an essential component to growing the literacy skills of our students. Regardless of grade level, when planned thoughtfully, all students can learn to engage in skills and habits that bring them closer to an author’s words and become stronger at understanding and analyzing texts. Study ways of scaffolding close reading skills, from fun and focused lessons that allow every learner access, to raising to more complex texts. A full day of learning that will lead to more student-centered teaching of close reading, and bring reading joy and deep conversations to every classroom. (Available 4-12) One of the best experiences in every reading classroom, when done right, are book clubs! Learn methods for supporting students in this fun, functional, and deep reading experience. Book clubs allow students to read with peers, in texts they can read with strength and joy. Learn ways to deepen book club experiences through writing-about-reading, conversation development, and teacher conferring. Management techniques and assessment ideas will be shared. (Available K-12) Our multilingual students (sometimes referred to as English Language Learners, Bilingual students, or English as a New Language students) bring an incredible skill set to learning in our classrooms. Adaptability, a complex neural network formed when learning additional languages, and a beloved culture and life experiences that enhance every room. In this powerful one day workshop, learn how to build upon the strengths of multilingual students in ways that support all students in your classrooms. Infuse language objectives in meaningful and practical ways, bring in methods of recursive instruction, and learn to highlight and celebrate your learners’ development. (Available 6-12) Moving from more traditional forms of assessment and grading to standards-based grading can be inspiring. In this one day workshop, learn how to align your local standards to the methods, practices, and mindsets of your instruction. From formative assessments, like conferring and studying student work, to summative ones, like grading readers and writers, this day will help you and your colleagues make important moves that put learner’s growth front and center. Request a workshop or institute at your district, school, organization, or university. We also provide custom topics based on your goals and informed by our research base. We will only use this number if we are not able to reach you via email. One day workshop? Multi-day institute? Best estimate. 10? 50? 100? Please list specific dates, a range, or "flexible." Please select the topic(s) you are interested in bringing to your community. You may also select "custom" and describe what you are looking for below. Provide a specific topic or your general direction/goals and we will work with you to define the best fit based on our research base. Any further information needed to help us fulfill your request? Check the box to join our email newsletter.